"Do you mind if my friend sits this one out? She's just dead." The best of the worst; my (not so) guilty pleasure. Thunderball is the fourth Bond film in the franchise and features Terence Young returning to direct after Guy Hamilton took over for Goldfinger. As a result it feels much more like Dr. No and From Russia with Love in the way it tries to ground itself in the real world of espionage rather than relying on sporadic comedy beats. However, despite its more grounded aesthetic, a lot of it still comes off as a bit silly (e.g. jet pack for one scene and then never again). This might be caused by the multitude of parodies which have come out since its release (primarily Austin Powers), and as much as I don't think it's fair to hold this film responsible for that, it's also hard to take things like Largo's shark tank seriously when we've had so many villains do the same thing in a comical way. 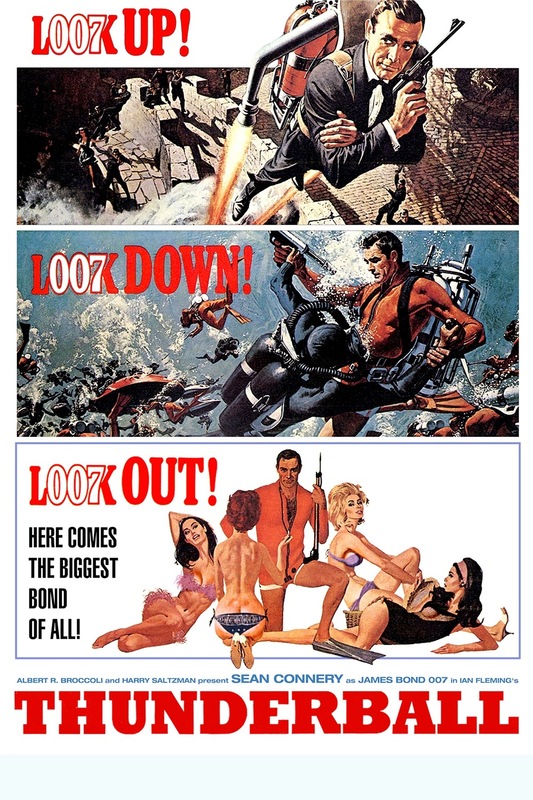 But as much as I can now recognize the flaws in Thunderball (the action in the last act is particularly messy), it will always have a special place in my heart. It was my favorite early Bond when I was young, and I have many happy memories of watching it with my father. 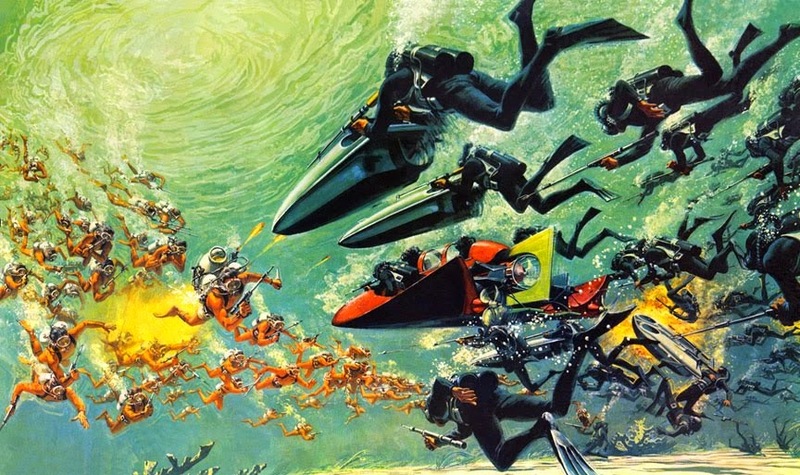 The underwater sequences in particular stick out in my mind, and they really speak to what I want in a Bond movie. I want him to be sneaking around underwater taking photos of the secret hatch in the villain's boat. I want him to be infiltrating the villain's secret hideout at night, turning the guards against each other. I want him to have his own secret hideout, where he can be equipped in the field and go out on recon chopper flights with Felix. And more and anything, I want him to be walking around exotic locations in a fancy suit. The movies really come alive for me when Bond is doing this sort of real espionage stuff, and this one keeps these scenes a high priority. As a result it feels more like a espionage thriller than the action movies many other Bonds turn into, but that makes it all the greater in my book. Thunderball also happens to have one of my favorite of all the Bond soundtracks. It might not have the most iconic Bond theme as far as the title songs go, but the way John Barry (composer on 12 of the Bond films and winner of 5 Oscars) uses musical motifs to tie together the individual songs really pushes my buttons in the best way. In particular, there's a theme that I absolutely love which starts in the clinic and runs through the rest of the soundtrack. For all its strengths, the film never really finds its groove narratively speaking. The plot doesn't quite come together into anything more than a jumble of scattered characters with half-formed plans. It tries to create a sense of global tension by having Largo threaten the world with nuclear weapons, but it never feels like more than Bond vs. another nemesis. The realistic tone works, but it also becomes the film's undoing as it prevents Bond from having fun with his sillier tropes (e.g. Goldfinger) and makes the film a bit more dull than other outings. Overall it's still one of my favorite 007 outings for the strong moments which rise above the forgettable narrative. Sadly I don't hold it in as high esteem as I once did, but thanks to its grounded focus on espionage it continues to stand out as a part of the better half of the Bond catalog.